Create your own stamp by uploading a black and white logo or art. Choose from a logo only design, or add 1, 2, or 3 lines of text too! Art submitted must be a high resolution JPG or PNG file, 300dpi or higher. 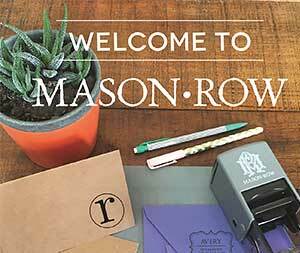 Design your own 1 5/8" self-inking stamp with Mason Row! Upload artwork or logo, and a line of text. Perfect for business or personal use, add a personal touch to your wedding, social correspondence, business and more. Design your own 1 5/8" self-inking stamp with Mason Row! Upload artwork or logo, and a two lines of text. Perfect for business or personal use, add a personal touch to your wedding, social correspondence, business and more.